Sure, clean and fresh foods are always best, but in a pinch it’s a good idea to have a few healthy frozen dinners meals on reserve in the freezer. Not to mention that packing a lunch for work when you haven’t been to the grocery store in two weeks gets way less stressful when you have a few healthy frozen dinners to choose from—instead of trying to concoct a meal from peanut butter, tuna and popcorn (been there, done that). But not all frozen dinners are created equally. Oh, no. Some have sodium counts that make us thirsty just looking at them. Others taste like cardboard. And there are some out there that are just plain uninspired. So we set out on a quest to find the best healthy frozen dinners. Notice that they’re mostly all either organic or made of totally natural ingredients—all good things in moderation, yes, but who wants to eat chemicals? Not us, say the FBGs! 1. 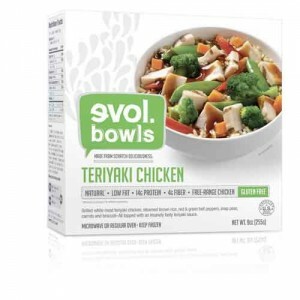 Evol Bowls Teriyaki Chicken. Evol Bowls (get it? Evol is “love” spelled backwards. Awww…) makes some pretty good healthy frozen dinners. This Teriyaki Chicken Bowl has just 250 calories and packs in 14 grams of protein. With a cook time of four minutes, the mix of grilled free-range white-meat chicken, steamed brown rice, red and green bell peppers, snap peas, carrots and broccoli is dang tasty. They’re pretty pricey at $4.99 for each Evol Bowl, but we think they’re well worth it. 2. Cedarlane Garden Vegetable Enchiladas. If Mexican food is your healthy eating downfall, take note to stock up on this healthy frozen dinner. Filled with cheese, beans, chilies and corn and topped with an enchilada sauce, these gluten-free and low-fat vegetarian enchiladas fill you up. With 280 calories in the package, you can easily pair it with a piece of fruit for a well-rounded meal. 3. Kashi Lemongrass Coconut Chicken. Pretty much seems that anything Kashi makes, we generally like. And the Kashi Lemongrass Coconut Chicken is no different. A colorful frozen dinner with a generous amount of veggies, whole-grain pilaf (does that word crack anyone else up, or is it just me?) and a lemongrassy sauce, each 10-ounce portion (a totally decent size for most healthy frozen dinners) has 300 calories and seven grams of fiber, so it fills you up pretty darn well. Kashi does it again! 4. Amy’s Garden Vegetable Lasagna. Amy’s rarely does wrong in our book, but this Garden Vegetable Lasagna is our favorite. Another vegetarian-friendly frozen dinner on our best-of list, this healthy frozen dinner is gluten-free, fresh-tasting and filling. With 290 calories, it doesn’t taste exactly like the kind you make from a real garden, but it’s not that far off considering it’s in a box. The tomato sauce is super tasty! 5. Cedarlane Low-Fat Pizza Veggie Wraps. It wouldn’t be a best healthy frozen dinners list without pizza, now would it? While pizza isn’t always the healthiest or easiest to eat of healthy options, this Cedarlane Low-Fat Veggie Wrap strikes a fantastic balance of being low calorie (220 in a wrap) and portable. Organic and stuffed in a wheat tortilla with everything you love about pizza—tomato sauce, spices, black olives and veggies—this wrap is crave-worthy! I am glad you mentioned Amy’s. I have found several of their meals taste and nutritious. I like the enchilada’s either as a meal or separately. If you do not have time to cook and want to watch your calories, they are a good pick. Thanks so much for this post! I just started a part-time job in the evenings and frozen dinners between jobs have become my dinner 4 nights a week! I love everything Kashi makes but it’s good to have alternatives so I don’t get tired of them! I actually really like the Miso Salmon with Udon Noodles by Starboard. I find it in the frozen seafood section of my grocery (not by the fish sticks, etc, but by the seafood counter). Reasonable at 340 cals, 12g fat, 37g carb, 22g protein, 580mg sodium. I always keep a very small stock of frozen meals in my freezer for those absolutely crazy weeks when the thought of cooking ANYTHING makes me tired and i don’t want to be tempted to pick up horrible take-out on the way home. Thanks for these suggestions – the evol bowls sound awesome! I like that you have healthy recommendations on here. The calories are not the only problem, it is the sodium as well. Maybe next time you can give us the sodium count?? I am a vegetarian, but since I have IBS and cannot eat veggies like broccoli, Brussels sprouts, cabbage, and beans, it would be helpful for me to know which veggies are in the meals. It seems broccoli is a very popular veggie to put in most frozen dinners. Are these meals only available on-line or are they sold at grocery stores? We have Trader Joes and Whole Foods here. A word of advice: Don’t go for the Fire-Grilled Steak Evol Bowl… as I microwaved it, it smelled (and I kid you not, several other teachers came into the faculty room and said the same exact thing independent of each other) like STINK BUGS. It was atrocious. It tasted okay, I guess (and I am NOT a picky eater), but the aftertaste was that of the stink bug smell. It was nauseating. For those of you who don’t have experience with stink bugs, an increasingly invasive pest on the east coast, consider yourselves lucky. I’m kind of afraid of the Teryaki chicken bowl, which I also purchased, but if you say it’s good, I guess I’ll try it (on a day I have an emergency lunch back up plan! ).